We would like to take this opportunity to thank all of those who have either given or offered assistance and support to my family following the fire at our home on the night of January 25, and a special thanks to the emergency services that attended. Anyone who was present either at the time or who has seen the remains will appreciate the level of destruction wrought upon our home and the contents within, however, as noted in this paper last week, all of us were unharmed and have been provided with accommodation nearby. The support given by friends, work and the wider community has been truly humbling, and as a family we thank you all and look forward to returning to our home, hopefully sometime next year. I must commend our MP Brendan O’Hara on his vision and wisdom on his recent fact-finding trip to the Faroe Islands to see first hand how The Faroese inter-connect their islands with 44 subsea and through mountain tunnels. This common sense approach guarantees safe connectivity 24/7 in any weather providing confident travel which is the least the people of Mid Argyll, Kintyre, Islay and Jura should expect. This area of Argyll is the most fragile in the region. The people of Argyll, businesses and visitors deserve no less. Forget the squandering of £46m on unreliable, mitigation measures trying to justify a flawed decision made many years ago to use the Old Military Road as a diversion which has failed on many occasions and now has a landslip between the two roads. Forget the expensive excavation of pits by the A83 rather use the cuttings into the hillside to form a two lane road protected with a flow over canopy with closed outer edges at the four problems gullies. If the contractors on the present scheme can work without any road closures then the flow over canopy option would not lead to closures as many officials and some politicians claim. This is a red herring postponing ‘a proper solution’. When this is option is completed it will save on the expense of manning the diversion route involving 12-14 personnel and 6-8 vehicles, replacing expensive nettings, delays whilst the farmer clears his animals and collect his fees. A scandalous waste of public money. Solve The Rest Landslides and stop wasting on mitigating measures. Like Brendan O’Hara I’m neither an engineer or geologist but both of us are blessed with plain common sense. If the Faroese can build a tunnel at £12.5m per kilometre surely a simple open sided 500m canopy would cost considerably less. In 2014 at Dawlish 2.2km of double tracked railway and 1.2km of sturdy seawall was built at a cost of £40m in eight weeks. Why have we in Argyll after nine years, four different Transport Ministers and £46m spent and still have no guaranteed safe passage 24/7 on The Rest and Be Thankful? Follow the Argyll Advertiser’s campaign ‘Invest in the Rest’. Transport Minister Michael Matheson, Transport Scotland and our Government must abandon their obsession with mitigation measures and fund a permanent solution. We demand no less. 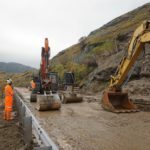 Calls for assurances that the Rest and Be Thankful section of the A83 will be improved to resist future landslides were made during a session of Transport, Infrastructure and Connectivity questions in the Scottish Parliament. I quizzed transport secretary Michael Matheson, about what was discussed at the last meeting of the A83 Taskforce in November 2018, and asked what assurances the Cabinet Secretary could give to local residents and businesses who rely on the A83 being open at all times. 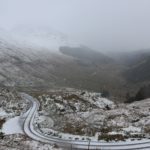 The Rest and Be Thankful was closed off for nine days in October 2018 following the largest landslide in a decade, forcing road users to either take a major diversion, or to use the Old Military Road during certain hours of the day. A number of petitions were created during the period of the incident, including one by myself, calling for a permanent solution to the Rest and Be Thankful. The transport secretary said that the meeting was ‘full and frank’, and that there would be a ‘review of the potential for additional landslide mitigation measures at the Rest and Be Thankful’, and that this would be discussed at the next A83 Taskforce meeting in March 2019. There was also a commitment that Argyll and Bute would be ‘prioritised’ in the next Strategic Transport Projects Review. I welcome the assurances by the transport secretary that there will be a review of any additional measures for the Rest and Be Thankful, and that Argyll and Bute will receive priority at the next Strategic Transport Projects Review. 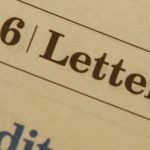 Last issue’s (February 1) letter raising concerns about the UK government’s proposed use of the army’s reserve force in the event of a no-deal Brexit is timely. In case anyone out there still thinks a no-deal Brexit is a good idea it’s worth noting that the legal authority (s56(1)(b) of Reserve Forces Act 1996) allowing the Secretary of State to take this step requires him to establish that it is necessary ‘for the alleviation of distress or the preservation of life or property in time of disaster or apprehended disaster’.